Iranian Foreign Minister Mohammad Javad Zarif has met with U.S. Secretary of State John Kerry for the first time since the finalization of the nuclear agreement in July in Vienna. 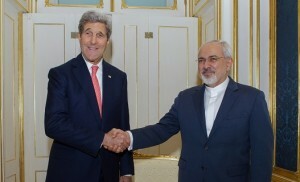 Zarif and Kerry met on Saturday September 26 in New York on the sidelines of the United Nations General Assembly. Kerry told reporters that he will meet with Zarif in the coming week in a series of meetings to discuss solutions to the Middle East crisis. Kerry said there is a need for peace in Syria, Yemen and the region. Zarif also stated that while he is prepared to discuss regional issues such as the death of pilgrims in Mena with the U.S. Secretary of State, he stressed that the chief focus of the talks with his US counterpart will be the “implementation of the nuclear agreement and elimination of economic sanctions”. The United States has expressed interest in discussing the conflict in Syria with Iran. Iran’s president also told reporters on Friday September 25 that after the finalization of the nuclear agreement with Iran and the 5+1, it may be possible to commence talks over other issues.